Use cold water for optimal results. If you use another cooking liquid, such as vegetable, chicken or beef broth, chill it in the refrigerator for at least an hour prior to use. 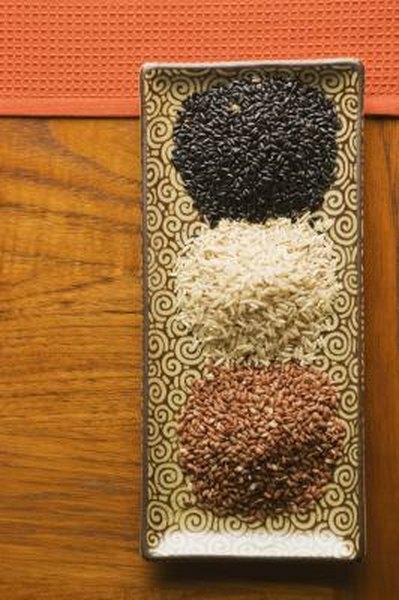 Medium-grain rice, such as red rice, has a greater tendency than long-grain rice to stick together as it cooks. To avoid this, add 1 to 2 teaspoons of olive oil, vegetable oil, nut oil or unsalted butter to the pot before cooking. Adding a small amount of oil or butter also helps prevent the water from boiling over. Rice cookers produce hot steam, so don’t place yours beneath cabinets or use it without the lid in place. The Encyclopedia of Healing Foods; Michael Murray, N.D., et al.